In the City of Bend survey in 2015, 77% of residents considered these values "extremely important". Increase depth of water: a time limited benefit. In a City Club forum in 2013 a panel of 3 hydrologists opinioned that 80% of sediment will reaccumulate within 10 years, 90% after 20 years. So, if depth is increased by 5 feet as currently proposed, increased depth would only be 1 foot after 10 years, and 6 inches after 20. Impact on weed beds and mud flats: a minimal benefit. 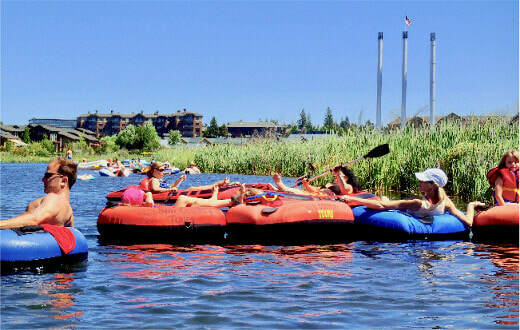 Kayakers and paddle boarders complain of the weeds in lower Mirror Pond. But experience after the 1984 dredge documents how time limited this benefit would be. Problematic weed beds recurred only 3 years after the 1984 dredge (The Bulletin, August 13, 1987). Mud flats are exposed when pond levels drop when dam repairs are made or when irrigators do stock runs during winter low water conditions. As for weed beds, this was a recurrent issue only 3 years after the 1984 dredge. (The Bulletin, November 17, 1987). Project execution: During the dredge recreational use of the pond will be disrupted, city roads will carry hundreds of heavy trucks, and county landfill, already near capacity, will be stressed. Mirror Pond today - how can dredging improve on this historic view? 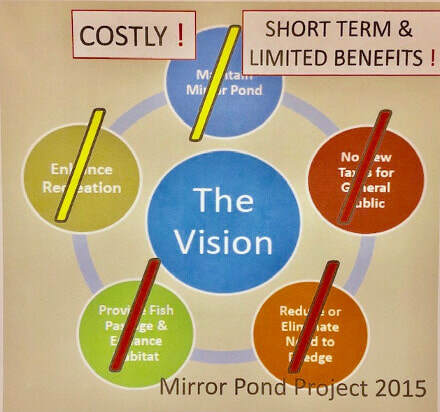 In an earlier communication I presented my arguments against public funding of the proposed dredging of Mirror Pond. In this communication I will present one perspective on the future of the pond if dredging is not implemented. It can be termed management for natural succession. Part II of this communication will illustrate a possible integrated strategy for the pond based on natural succession. and in a letter to the editor in The Source (Dec 19th). At a fundamental level, public funding should require public support. Is public support justified for the current dredging proposal? I've used three approaches to answer the question. Some people believe that dredging Mirror Pond is necessary, fearing if we don’t dredge the pond, it will mysteriously disappear. Not true. Now we are being urged to publicly fund dredging at a cost of more than $6 million dollars, and to do this on a fast track. Wow!